Aviation propulsion system structures are subjected to challenging conditions such as extremely high velocities, ultra- high/low temperatures, and excessive dust/sand/smoke/volcanic ash conditions during military operations. Therefore, the research and development of high-performance engine materials with superior characteristics such as great mechanical strength, high fatigue resistance and creep resistance, good tolerance to wide temperature variations, and excellent resistance to corrosion and oxidation is essential to the evolution of highly robust and efficient propulsion systems without a compromise on capabilities, even in hostile environments. 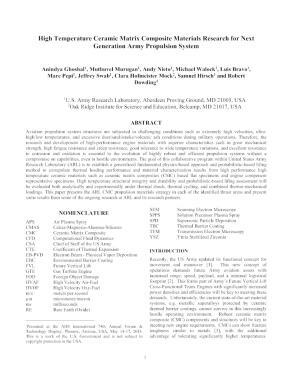 The goal of this collaborative program within United States Army Research Laboratory (ARL) is to establish a generalized fundamental physics-based approach and probabilistic-based lifing method to extrapolate thermal loading performance and material characterization results from high performance high temperature ceramic materials such as ceramic matrix composites (CMC) based flat specimens and engine component representative specimens. High temperature structural integrity and durability and probabilistic-based lifing assessment will be evaluated both analytically and experimentally under thermal shock, thermal cycling, and combined thermo-mechanical loadings. This paper presents the ARL CMC propulsion materials strategy in each of the identified thrust areas and present some results from some of the ongoing research at ARL and its research partners.